This is an analysis of optical images from Terra, Aqua, and Suomi NPP satellites, as well as associated synthetic aperture radar (SAR) images from Radarsat-1/2 and Sentinel-1A/1B satellites, which reflect mesoscale atmospheric cyclonic vortices (MACV) and local cyclones over the Black and Caspian seas. The MACVs are observed both in the cloudiness field on optical images and in the sea-surface roughness field on SAR images, induced by the near-surface wind. The analysis SAR images of the sea surface and optical images combined with NCEP reanalysis has allowed us to obtain both qualitative and quantitative data on these phenomena. The formation of MACVs has been shown to occur rather frequently over the eastern Black Sea, as well as over the northern and middle Caspian Sea. They are 50 to 200 km in diameter, their lifetime is usually almost a day, and they can create wind speeds of 10–12 m/s over the sea surface. From time to time, they can deepen and lead to a sharp deterioration in the local and regional weather. The Radarsat-1 and Radarsat-2 SAR images were provided by SCANEX Group. The original rights of Radarsat-1 and Radarsat-2 data belong to MacDonald, Dettwiler and Associates Ltd. (MDA); the original rights of Sentinel-1А and Sentinel-1B data belong to the European Space Agency. This study was supported by the Russian Science Foundation, grant no. 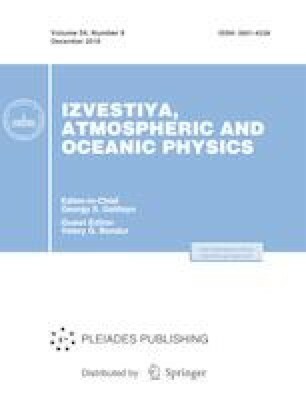 14-50-00095 provided to Shirshov Institute of Oceanology, Russian Academy of Sciences.